Wed., Dec. 30, 2009, 3 p.m.
Liberty Lake police Sgt. 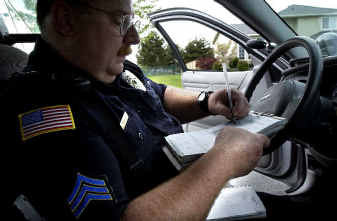 Ray Bourgeois writes a speeding ticket recently for a man he says was driving 43 mph in a school zone. Please tell me if you have occasion to use this advice. I really need to know if it works, but I'm concerned about option two: "Drive around with something really weird in your car." It's the holidays, we're coming off a brutal recession, and the last thing any of us needs is a speeding ticket. And yet someone reading this -- I hope not the person writing this -- is going to get a speeding ticket in the next week or so. According to the National Motorists Association, between 25 million and 50 million speeding tickets are issued every year. So with that in mind, and since plenty of people get pulled over on their way to and from work, we're offering some suggestions for talking your way out of a ticket. Posted Dec. 30, 2009, 3 p.m.